Radiant Vol. 1 Review – AiPT! A new magical shonen series makes its debut. Seth has big goals of defeating Nemeses, but first he must earn the trust of the very villagers he wants to protect–not an easy task when those who use magic are just as feared as the Nemeses they fight. Even worse, Seth can barely control his monstrous powers! It’ll take more than brute strength–although it’ll take that too–to get Seth’s quest out of the boonies and into the big time! As far as its characters go, this volume doesn’t stand out much. Case in point, Seth isn’t notably different from any other shonen protagonist apart from his design. He ignores the warnings of his mentor, Alma, and he frequently causes large amounts of damage to other people and places as a result of poor planning and reasoning skills. We don’t learn much about his history or motivations here, just enough to know that he’s determined to defeat the series’s ill-defined threats, the Nemeses. The fact that Seth uses magic with his bare hands as opposed to with tools makes him stand out from other wizards in the manga, but it’s not a unique enough gimmick to generate much interest on the reader’s part. Overall, it’s hard to feel sympathy for Seth regarding how society fears and treats him when he is every bit as dangerous as the creatures he battles. Unfortunately, this volume’s other characters aren’t very memorable either. Alma is probably the most likable, as she’s a hardass with little patience for Seth’s poor choices and unthoughtful behavior. On the other hand, the Nemeses are undefined to the point of being tedious to read about. We learn that they can more or less look like anything, leaving little room for distinctive and symbolic visuals. There’s also a lack of information regarding what they are or why they do what they do. This lack of clear motivations makes it difficult to care about either the antagonists or the protagonist, as none of their actions are grounded in meaningful emotion. The strongest aspect of this manga is easily its artwork. The line-work throughout is very clean, sharp, and polished. Though the characters’ personalities are disappointingly generic, their designs are quite delightful. Their facial expressions in particular are pleasantly emotive and frequently a source of comedy. There are also many magical trinkets present that help give the world the sense of magic and fantasy that is sadly missing from the actual plot. All in all, this volume is usually nice to look at. With that said, the action sequences are a major exception to this. It is frequently difficult to parse out what exactly is going on, and the answers seldom seem worth the effort of finding them. This problem arises largely from issues with both overabundance and scarcity. There are a plethora of characters and concepts throughout, but precious few of them are well-defined. So much about this series is left ambiguous that it makes what’s actually presented unnecessarily hard to process. It feels like the reader isn’t given sufficient context to form a solid understanding of the series’s world and its inhabitants. These problems are exacerbated in battle scenes due to faster pacing and some ineffective page compositions. It’s troubling that such portions are among the volume’s worst, as this is clearly going to be an action-heavy manga. Overall, Radiant Vol. 1 is a disappointingly generic debut. The characters lack both personality quirks and clear-cut motivations, and as such they come off as little more than archetypes. Many of the designs and facial expressions throughout are charming, but the action scenes are muddled and have little sense of stakes. 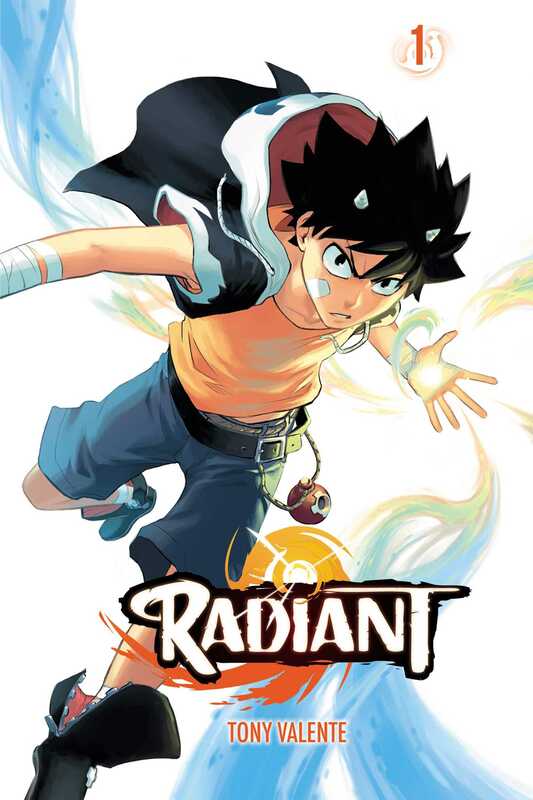 This volume isn’t terrible, but Radiant definitely fails to hit the ground running. The series’s first impression is a forgettable one. Though its artwork impresses, this series fails to stick out from the large flock of similar titles.